Our free standing letterboxes offer a wide choice of stands and frames to choose from, each finished to a high quality standard. Free standing letterboxes are ideal to position outside student accommodation and private apartments, where wall space is not required with this mail delivery solution. Our commercial letterboxes conform to Royal Mail requirements and Europeean standard EN13724, with various different specifications available, depending on the model you choose. Features include gasket seals, anti theft devices and individual letterbox keys suited to other devices, such as your entrance door or garage key. Further features include engraving, an intercom system, a video camera and more, with each letterbox in the bank able to receive A4 size mail. Require a safe solution to hold your daily mail? Multiple letterbox secure designs help tackle the UK fight against mail theft in apartments with anti theft devices incorpated in the design. All of our letterbox banks are manufactured from electro-galvanised steel which ensures optimal resistance to corrosion. Our doorside panel letterboxes operate the same way as our free standing range. 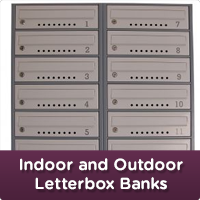 Our indoor letterbox banks have various designs, with surface mounted, recessed and through the wall styles available. We can assist you in selecting a multiple letterbox system, which will work aesthetically with the architecture and interior design of your property. With so many features devised into each multiple letterbox system, why wait....select one of our commercial letterboxes today and start specifying the features you require. Whether you need to inform your student accommodation officer, apartment landlord or boss at your offices, we can provide the perfect solution!